For tourists, the beautiful Lake of the Ozarks must seem in complete harmony with the natural order of its surroundings. 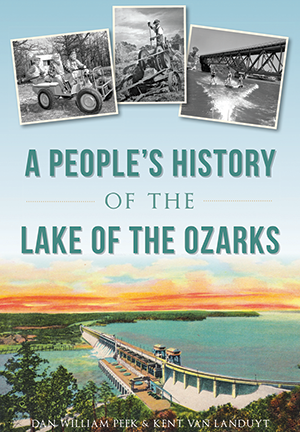 Even lifelong natives can struggle to imagine a time when the reservoir created by the Bagnell Dam didn't exist. But beneath the placid waters of the lake that draws bustling visitors to its shores lies the drama of a remote Ozark community suddenly thrust into an urban world. True locals Dan William Peek and Kent Van Landuyt piece together the fascinating story of how that community adapted to the lake that redefined their home. Kent Van Landuyt, a lifelong resident of the Ozarks, has over forty years in public service as a sociologist and planner with the state of Missouri. Dan William Peek, an Ozark native, is a marketing consultant, banjo player and author of Live! At the Ozark Opry and To the Point: The Story of Darts in America.